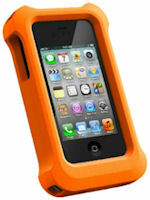 Lifeproof has updated its line of tough cases with new models for the iPhone 5 and the iPad (see earlier post). These cover your entire device, including controls and jacks, so you can use it with confidence even in unpleasant winter weather -- making it waterproof (to 2 meters), dustproof, snowproof, and shockproof (up to a 2 meter drop). The Lifeproof iPhone 5 frē case is even more low profile than the iPhone 4/4S case, adding only 1.5 mm to each edge and weighing less than an ounce (28 g). It also adds a user-requested window on the back side to showcase the Apple logo ($79.99). 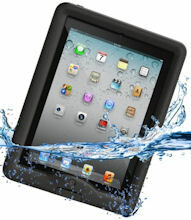 The Lifeproof iPad 2/3/4 nüüd case uses a different design which does not cover the iPad screen. Instead, the case covers the back and sides, and seals around the front frame, leaving the screen uncovered for better clarity and responsiveness ($99.99). For use around water, there's also the Lifejacket foam cradle for your case so you can use it securely around water -- since it will float if you drop it. The Lifejacket also adds additional drop protection, provides an enhanced grip when wet, and is hard to lose with its high-visibility orange coloring (iPad $59.99, iPhone 4/4S $39.99). There are also Lifeproof cases for the iPhone 4/4S and iPod touch 4G, plus accessories for securely mounting and wearing your device when on the go, including armbands, hand/shoulder straps, and bike mounts. See my Holiday Gadgets 2012 coverage of Portable Accessories for more on cases and other useful and fun ideas. Hurricane Sandy has pointedly reminded us of the usefulness of auxiliary chargers for our continually growing collections of portable electronic devices. So if you are thinking about portable chargers for your devices, there are two specs you should compare. The first is the capacity -- how much electric charge you can store in the battery -- measured in milliamp hours (mAh). Speaking roughly, 800 to 3000 mAh can charge a smartphone multiple times, and 4000 to 6000 and up can charge multiple devices, including phones and tablets. The second key spec is the output -- the strength of the flow of the electric current -- measured in Amps (A). Typically, 1.0 Amps is used for charging devices like smartphones, and 2.1 or more is required for charging a larger tablet device, or to charge multiple devices simultaneously. Some charger manufacturers helpfully name their products with the mAh capacity, to help you trade off the charging performance versus the size/weight and cost. MyCharge goes a step further, by also building in the power cords / adapters needed to use the device, so you don't need to hunt around for the proper cable, or carry anything extra. 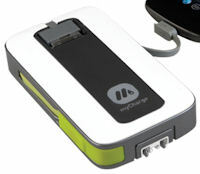 For example, the MyCharge Trek 2000 (with 2000 mAh battery) includes a built-in iPhone dock with Apple connector, and a microUSB cable so you can charge a headset or other device -- simultaneously. Plus it includes a built-in USB cable for recharging the MyCharge from a USB wall adapter (in 3 hours) or from a computer (5 hours). It's also useful to be able to check the battery level of these devices, so the Trek 2000 has a battery check button with 4 LEDs. Plus, it plays a notification tone when connected, disconnected, and fully charged (and you can disable this with a paper clip). The Trek weighs 4 ounces (about the same as a new iPhone), and is available for $54. For more power, step up to the MyCharge Peak 6000, with a 6000 mAh battery and total output of 3.1 Amps, so it can charge a tablet, one smartphone up to 4 times, or up to 3 devices simultaneously. 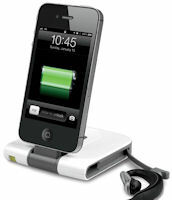 The Peak has three built-in charging options -- Apple cable, microUSB cable, and a USB port. And it has two options for recharging the battery -- a USB cable (which takes 13 hours when plugged into a computer), and fold-out AC prongs for fast charging from a wall outlet (in 4 hours). It also as an even nicer feature for checking the battery -- in addition to 4 LEDs, it also provides voice notification of the battery level and charge complete -- and in your choice of four languages). The MyCharge devices make a lot of sense to have around as we head into deep winter. In particular, the Peak 6000 packs a lot of power in a relatively small and light package -- at 5 1/3 x 3 x 1 inches and 8.5 ounces. It's available for around $99. See my Holiday Gadgets 2012 coverage of Portable Accessories for more on chargers and other useful and fun ideas. Mini speakers can add a significant boost to your phone, tablet, or even laptop to better enjoy and share your music -- and they make a great last-minute holiday gift! I've previously covered the Big Blue Live Bluetooth Wireless Speaker from Brookstone that's a bit bigger than other "mini" devices, to work well as a desktop speaker and even speakerphone (see earlier post). And Brookstone has added a Mobile Mini Speaker that is palm-sized, at 3 inches tall and 2 1/4 inches wide, with a clean look -- metal with a stitched wrap in black, brown, or red. And it puts out a nice sound, with better range than the built-in speakers on your phone or tablet, plus it has a pop-up top for extra bass and volume. 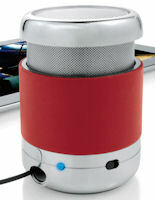 The Mini Speaker recharges via USB, for up to 11 hours of play time. It's available for $34.99 -- for a friend, or to keep for yourself. See my Holiday Gadgets 2012 coverage of Portable Speakers for more on audio and other useful and fun ideas. With the end of the holiday shopping pressure, it's time to think about getting better use and enjoyment from your own devices. For example, shooting photos with your smartphone can be a bit of a pain, since you have to hold it up high in order to see the display. Even worse, holding up a big tablet in that kind of vertical position is just not natural, and is rather clumsy in public spaces. The MirrorCase from RHP Multimedia for the iPhone and iPad is a clever response -- a slip-on case that uses a mirror to allow you to position your device horizontally, so you can hold your smartphone unobtrusively down by your waist, or simply sit your tablet on a table to shoot an event. The case is designed as a plastic shell with soft touch finish. It extends out along one end of your device, with a mirror to reflect the scene into the back mounted camera. You then need to use the free MirrorCase app for shooting photos and videos in order to correct the flipped image, which may involve some cropping of the full frame. The extrusion for the mirror housing also serves as a mount to tilt up your device when using on a flat surface, but can get in the way if you like to carry your iPhone in a pocket. The MirrorCase for iPhone 4 / 4S is $49.95. It also can be used as a shoulder rest when talking on the phone, plus the mirror can reflect the flash in the other direction to serve as a better flashlight. The MirrorCase for the iPad 2 and new iPad is coming soon for $79.95. It has an integrated kickstand to position the screen angle, an Acoustic Port to redirect sound from the back speaker towards the user, and a pen / stylus storage compartment. Just a simple mirror can make shooting phones and videos a more natural, comfortable, and less obtrusive experience. Pocket projectors from 3M and others make it easy and fun to share your photos and videos. Just hook up your laptop, or even your smartphone or tablet, and project away -- on a handy wall or even on the ceiling (see earlier post). These handheld projectors don't have the full brightness and large image size of full-size units, but they work fine for smaller groups, even with normal lighting. Some now also have wireless connections, or have built-in memory so you can store your clips or presentations or even documents, and project them directly without needing any other source device. Even better, as the required electronics gets smaller, we'll see them built in to devices such as camcorders (as with the Sony HDR-PJ series) and digital cameras (such as the Nikon Coolpix S1000pj). Or, you can build a projector into a smartphone case, as with the 3M Projector Sleeve for iPhone 4/4S. This is a DLP projector that's about the same size and weight as the iPhone. Just slide in your phone to dock with the integrated connector. Then use the iPhone Photos app to play videos or photo slideshows. The Projector Sleeve displays a 640 x 480 resolution image at 10 to 60 inches (diagonal), with LED light up to 35 lumens. Use the focus wheel to sharpen the image. There's also a Scene Mode switch to select Cinema (enhance color), Web (enhance text), or Eco mode (decrease brightness for power saving). The battery charges through a miniUSB port in about 4 hours, and runs for 100 minutes. You even can use the sleeve as an auxiliary battery for your iPhone by pressing the iPhone Charging Mode button. The 3M Projector Sleeve is available for $229. It's an easy way to share all those fun photos and videos that you have stored on your phone. See my Holiday Gadgets 2012 coverage of Portable Accessories for more imaging devices and other useful and fun ideas. Entries posted to Manifest Tech Blog in December 2012, listed from oldest to newest.